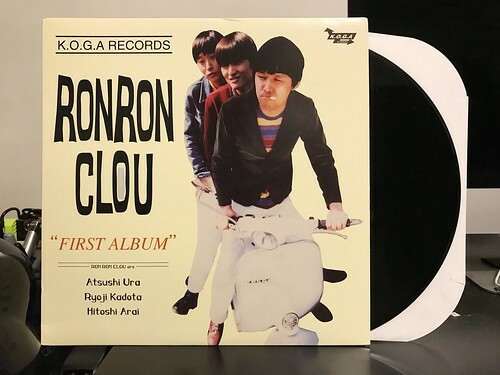 While in Japan, my number one record shopping goal was to pick up the three Ron Ron Clou LPs. I'm not sure why I set that as my top priority (aside from obviously wanting the records), but I ended up only finding one of the three. This lit a fire under me to track down the other two at all costs. For whatever reason, as soon as it seems like I can't have something, it just makes me want it even more. Luckily I was able to find a kind soul on Discogs who not only had both LPs I was looking for, but was also based in America. I managed to pick them up at a nice price and didn't have to pay for shipping them overseas. Bonus. Of the three Ron Ron Clou albums, I think First Album is the strongest. It has a very clear Odd Number-esque mod-pop vibe. Cross that with some Vacant Lot style hooks and you've got an album I can really sink my teeth into. I really love the little things about this album like the backing vocals and "oohs" in album opener "Annoying Kids Are" and the quick guitar riff wedged into the breaks of "It's Not Everything." I would have never heard of Ron Ron Clou if it weren't for the split 7" they did with Samantha's Favourite that came out on Snuffy Smile many years ago. That may be why I especially gravitate to the song "Stage" which appears on this album, but was also on that split 7". It's probably my favorite Ron Ron Clou song and I just can't get enough of the melody and energy the band has wrangled into it. It was worth the wait tracking down this album. It has been a long hunt, but finally being able to sit back and put it on the turntable is such a rewarding thing.